To start off our new page, one in a series of wildlife-watch pages to which we will add images, we feature photos taken by Dawn when out walking with her daughter Amber on 3rd February 2019.
immediately west of the volcanic hills known as Burnt Hill (left) and Hillpiece (right). and beyond to the left (west) can be seen the Potato Patches. 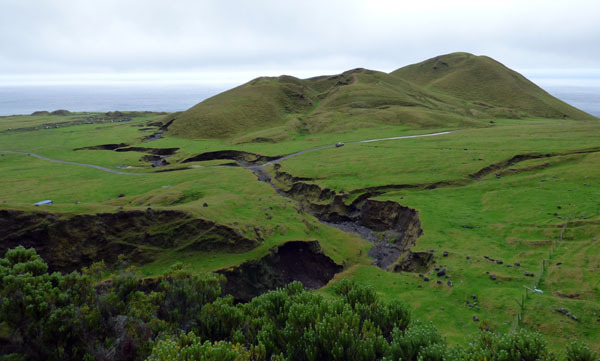 It is significant that Island Trees or Phylica Arborea now thrive on the cliffs and just above the plain. and it is likely that numbers are now increasing on Tristan (see below). 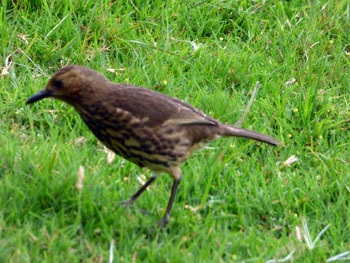 Endemic to Tristan da Cunha, Nightingale and Inaccessible Islands. Previous estimates (2007) put the populations at about 50 pairs on Tristan, 400 pairs on Nightingale and 850 pairs on Inaccessible. 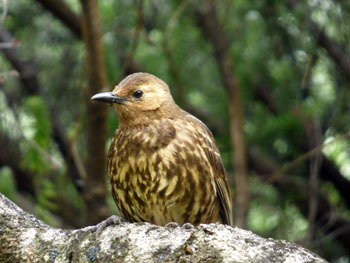 The Inaccessible Starchy Turdus eremita gordoni. Occurs at all habitats on Nightingale and Inaccessible but generally restricted to the mountain Base and gulches on Tristan. 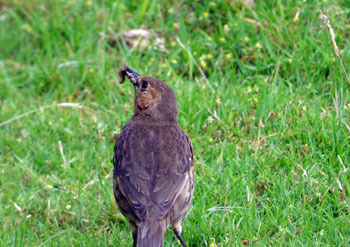 Omnivore, opportunistic feeder eating invertebrates, seeds, berries, and carrion, eg from skua kills. Can break open eggs with its bill and its tongue has a fringed edge adapted for licking up egg contents. Starchies are supreme generalists that can turn their beaks to just about anything. Peter Ryan reports that there is a note in press about them feeding on intertidal crustaceans and even 'by-the-wind-sailors' (a type of jellyfish) that washes ashore on Inaccessible - which is impressive because songbirds lack salt glands, and so seldom eat marine invertebrates, and very few birds at all are known to eat jellyfish. Breeds September - December, later higher up. Nest in thick vegetation, and lays 2-3 eggs. 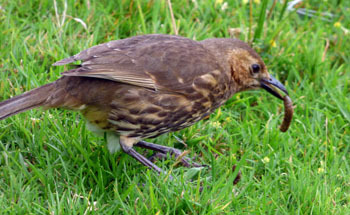 Chicks fledge after 20 days, remaining with adults for 3-4 weeks, when they are fed mainly on earthworms and Empetrum or Island Berries. Population at Tristan greatly reduced by predation by rats, and historically by cats. 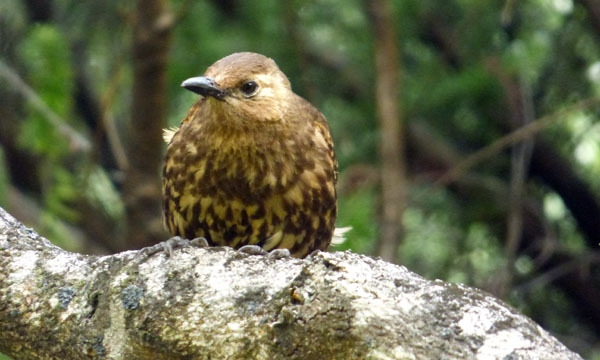 Also worth noting is the fact that Starchies are the only native land bird to survive on the main island of Tristan - both the endemic moorhen and bunting that were found on Tristan went extinct in the 19th century. Nevertheless, Gough Moorhens were introduced to Tristan in the 1950s and are now common on the island, especially the eastern mountain Base, cliffs and at Sandy Point. Selected notes from the 'Field Guide to the Animals and Plants of Trisatn da Cunha and Gough Island', Edited by Peter Ryan and published in 2007 by Pisces Publications. Peter Ryan has updated the Starchy information in the field guide to include the modern species names and additional notes in February 2019.